SS. Peter and Paul Cathedral in Indianapolis was hushed in silence on June 27 as more than 500 worshippers watched Archbishop Daniel M. Buechlein ritually lay his hands on the heads of transitional deacons Sean Danda and Christopher Wadelton, who were kneeling before him during the liturgy in which he ordained them priests. Men who have been ordained bishops, priests and deacons around the world over the past 2,000 years have had hands laid upon their heads. Fathers Danda, 26, and Wadelton, 43, are among the latest in that long line of those ordained for service in the Church. Quoting Pope Benedict XVI, Archbishop Buechlein reflected on the imposition of hands. Father Danda was humbled when considering the ancient nature of the ritual that he had just experienced. Archbishop Buechlein also encouraged the ordinands to value the relationship that they will share with their brother priests. 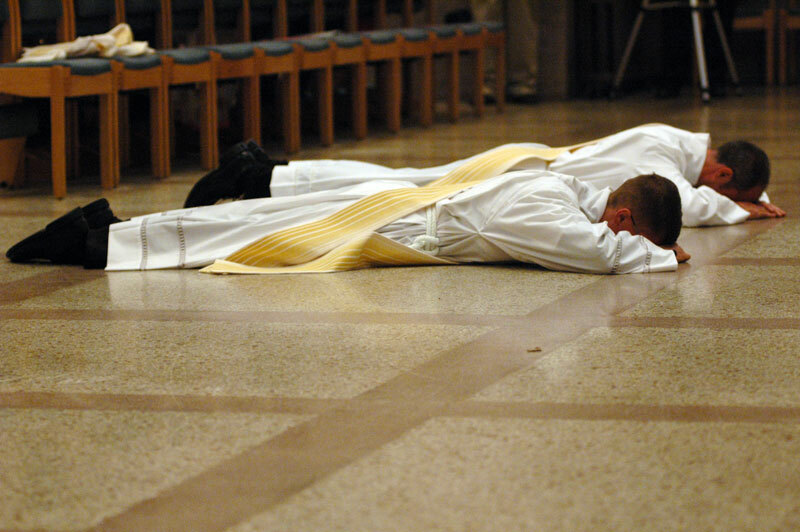 After the ordination, Father Wadelton spoke about how he experienced this fraternity when the priests at the liturgy laid their hands on his head after the archbishop had done so. Ann Wadelton, who worked for the Indiana Catholic Conference for many years, smiled as she watched scores of priests lay their hands on her son’s head. “To know that I’m a priest and that I’m welcoming them into the presbyterate that I was just welcomed into [was powerful],” he said. Although Father Danda is a brother to the priests of the archdiocese, Msgr. Joseph F. Schaedel, vicar general, spoke of him as his “spiritual son” after the ordination. Bishop William P. Callahan, auxiliary bishop and current administrator of the Archdiocese of Milwaukee, participated in the ordination liturgy. He also sees himself as a spiritual father of Father Danda since he served for a time as his spiritual director at the Pontifical North American College in Rome and ordained him to the transitional diaconate last fall in St. Peter’s Basilica. Franciscan Father Jeremy Harrington, the uncle of Father Wadelton, was also present for the ordination. Just two weeks earlier, he celebrated the 50th anniversary of his priestly ordination. Father Jeremy laughed as he considered how, with his nephew now a priest, he won’t have to preside over so many family baptisms and weddings. Father Wadelton, who is close to his many nieces and nephews, said about 80 of his relatives witnessed his ordination. His niece, Kellie Moore, 19, a member of St. Pius X Parish in Indianapolis, participated in mission trips to Guatemala and Honduras with her uncle last summer. Richard Danda was present to see his son ordained. Father Danda’s mother, Katherine Danda, was hospitalized during the ordination for treatment of a chronic autoimmune disease, but was able to participate in a Mass of Thanksgiving that her son celebrated the following day at St. Malachy Church. Because of his mother’s illness, Father Danda’s grandmother did much to care for him and his sister, Heather, from the time they were toddlers. Like others at the ordination, Father Danda’s sister, Heather, was impressed by the laying on of hands. In August, she will begin her postulancy as a religious sister in New Mexico in the Society of Our Lady of the Most Holy Trinity.